Taken from 60 More Quick Knits: "In this clever twist on a popular lace pattern, lacy cuffs are knit separately from the mittens and attached later. Dive into your button stash for the perfect finishing touch." 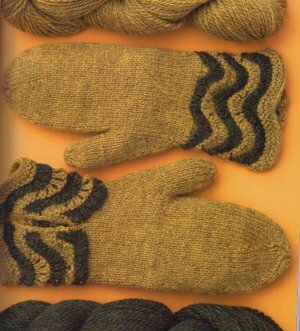 This pattern is from 60 More Quick Knits, pg 27 - Wave-Cuff Mittens. Size US 6 straights & US 5 DPNs (or size needed to obtain gauge), Size US E crochet hook, and two 5/8" buttons are required but not included. Gauge: 25 sts over 4"
Colors shown are #4010 Straw & #9448 Olive Heather. These colors are currently unavailable, but check out the options we have listed below!